What is FinX Mobile Money Suite? FinX Mobile Money Suite is a mobile payment software designed to enable wallet operators to provide a vast selection of custom and branded online payment-related products and services to their clients, including online banking, online bill payments, online shopping, merchant accounts, split bills, and online remittances among others. With FinX Mobile Money Suite, customers of wallet operators enjoy the ease of access to mobile financial services, enabling them to pay bills, shop online, and send money using their PCs and mobile devices. Wallet operators are able to further extend the reach of their services, discover new streams of revenue, and attract more customers who experience difficulty creating conventional bank accounts. FinX Mobile Money Suite comes with a plethora of features and services, including accounts, cash deposits, customer management, cash withdrawal, comprehensive business dashboards, reports, and business intelligence among others. FinX Mobile Money Suite is very easy to set, up, deploy, and maintain, as are all the other products by Teknospire. The software doesn’t require users to be technically well-versed to navigate and utilize the software to its full potential. FinX Mobile Payment Suite utilizes Open API to ensure smooth and seamless integration existing and new third-party apps. Thus, allowing you to further extend the software’s existing capabilities as well as add additional functionalities to an already robust and rich platform. FinX Mobile Payment Suite boasts of a user-friendly design that ensures a totally enjoyable and fast experience for its users. Your customers will definitely appreciate how seamless the navigation is and how smooth all their interactions are. Powerful and comprehensive reports fueled by rich business intelligence and analytics deliver a clear picture of your business. With highly actionable and data-driven insights, you can make intelligent decisions about your company’s finances and spending. Finx Mobile Payment Suite utilizes security solutions built on the most innovative and latest technologies, giving your clients peace of mind whenever they shop online, do online banking, send remittances, and more. What Problems Will FinX Mobile Money Suite Solve? The Banks uses FinX to acquire Mom and Pop Stores, Retail Shops, Post Offices, Pharmacy, Café’s etc. as their Agent Touchpoints and offer them a commission for every financial / non-financial service delivered to their Customers. Financial Institutions could use FinX to offer mobile wallets services to its customers. The mobile wallets could be used to disburse loan amount based on the collateral for customers. FinX payment suite helps institutions to bring cardless banking solution to their consumers, overcoming the cost of manufacturing, printing and distributing cards. No more Swiping, no more threat to card cloning. Simple to deploy on top of the core platforms or run as an independent platform. If you are considering FinX Mobile Money Suite it could also be beneficial to analyze other subcategories of Best Mobile Payment Systems gathered in our base of SaaS software reviews. There are well-liked and widely used applications in each software group. But are they automatically the best fit for your company’s specific requirements? A trendy software solution may have thousands of customers, but does it offer what you need? For this reason, do not blindly invest in popular systems. Read at least a few FinX Mobile Money Suite reviews and mull over the aspects that you want in the software such as the fees, main tools, available integrations etc. Then, select a few solutions that fit your wants. Try out the free trials of these products, read online reviews, get explanations from the maker, and do your homework meticulously. This exhaustive research is certain to assist you find the finest software platform for your company’s unique needs. How Much Does FinX Mobile Money Suite Cost? Contact Teknospire for information about FinX Mobile Money Suite basic and enterprise pricing packages. We realize that when you make a decision to buy Mobile Payment Systems it’s important not only to see how experts evaluate it in their reviews, but also to find out if the real people and companies that buy it are actually satisfied with the product. That’s why we’ve created our behavior-based Customer Satisfaction Algorithm™ that gathers customer reviews, comments and FinX Mobile Money Suite reviews across a wide range of social media sites. The data is then presented in an easy to digest form showing how many people had positive and negative experience with FinX Mobile Money Suite. With that information at hand you should be equipped to make an informed buying decision that you won’t regret. What are FinX Mobile Money Suite pricing details? 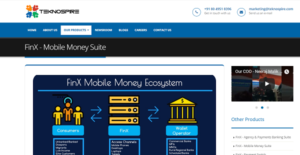 What integrations are available for FinX Mobile Money Suite? FinX Mobile Money Suite can integrate with any of the legacy banking system and newer software available in the market. If you need more information about FinX Mobile Money Suite or you simply have a question let us know what you need and we’ll forward your request directly to the vendor.